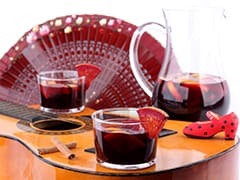 Before starting this Sangria recipe, make sure you have organised all the necessary ingredients. Wash the fruits thoroughly. Slice the oranges to a thickness of 0.5cm, then cut into quarters. Repeat the same operation with the lemons. Place the fruits into a bowl. Add the red wine.